The monthly average cost of care for this facility is estimated at $3,674. This is higher than the Phoenix estimate of $3,250. The cost average for the State of Arizona is around $3,150, versus $3,500 nationally. Located in Phoenix, Arizona, close to the Alhambra neighborhood, Huger Mercy Living Center offers senior care in a safe and comfortable setting. The neighborhood this community is located in is heavily populated, with approximately 37,743 residents in the zip code of 85021. It is a primarily middle income area, with an average household income of $44,596. The facility is located amongst plenty of local amenities, such as shopping, health care facilities, and churches. They are located just 1.1 miles from Surgical Specialty Hospital Of Arizona, there are plenty of drugstores within 1 mile of the community, and there are a number of churches within four miles, which include Queen of Holy Rosary Church, Black Canyon Church of Christ, Bethel Ev Lutheran Church, and Along Side Ministries. Huger Mercy Living Center offers assisted living. 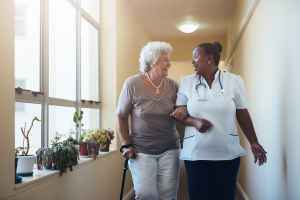 They can provide care for people who require help with common chores like preparing meals, showering, and house keeping, but who are still mobile and are somewhat independent.